The Humanitas360 Institute signed, on December 18th, a technical term of cooperation with the National Justice Council (CNJ in the acronym in Portuguese) with the intent to encourage civic-social entrepreneurship in the prison system. The objective is to contribute to the socioeconomic emancipation of inmates and former inmates, thus reducing recidivism and violence in Brazilian cities. During the event, the president of the council and of the Federal Supreme Court, Justice Dias Toffoli, said that “the way to weaken the criminal factions that work inside prisons is to secure the rights, services, assistance and public policies”. Therefore, through the cooperation between Humanitas360 and the Council, it will be possible to replicate the model of social cooperatives of inmates and former inmates. “Our intention is to create at least one of these organizations in each state of the federation, and from there, disseminate other civic-entrepreneurial activities that can empower people,” said Toffoli. Humanitas360 is currently developing three cooperatives in the prison system. The signed term aims at promoting resocialization in order to discourage recidivism. “The Brazilian prison population has been growing at a 6-7% rate every year, and that does not mean that violence is decreasing or that the feeling of safety is improving in society,” said Toffoli. The justice still said that inmates want to work and study, but the opportunity to pursue those activities in prison are few: only 12% has access to educational activities and only 15% has access to work related activities. “People go to prison with low levels of education. In the majority of the cases, inmates are illiterate or have completed elementary education at the most. Many times, they don’t have professional qualifications either,” warned Toffoli. The cooperation between the institutions aims at spreading the concept of civic-social entrepreneurship inside the prison system, functioning as an incubator of enterprises that will contribute to the reintegration of the prison population back to society. “In Women’s Prison 2 in Tremembé, in the country side of the state of São Paulo, Humanitas360 supports, along with the help of philanthropic partners, a cooperative of 30 inmates that produces pieces of fashion and handcrafts. The idea is inspired by the cooperative model that was implemented in Pará [a state in the north of Brazil],” explains the president of Humanitas360, Patrícia Villela Marino, referring to the Social Cooperative of Work and Art – Women Entrepreneurs (Coostafe, in the acronym in Portuguese). Coostafe is a pioneering cooperative inside the Center of Reeducation for Women in Ananindeua, a township of the Greater Belém, Pará. 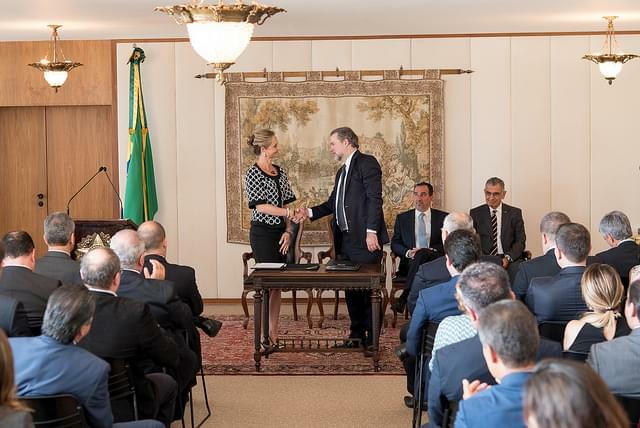 For Carmen, the agreement allows for advancements in the Brazilian prison system with viable alternatives that can create opportunities to those that hope not to return to crime. “I hope that with this agreement between the Council and Humanitas360, people start looking at the prison population with other eyes. They are people that made mistakes and that are willing to change their lives, change their story,” she said.